Flowers light pink, tubular, 20mm, 3mm diameter; arranged in terminal 4-flowered, or occasionally 3-flowered, umbels, on very short lateral branches. Synflorescences neat, spike-like, each with up to 6 whorls of flowering branches, on strong, erect, main branches; terminal apex of the stem continuing growth. Non-flowering lateral branches on the main flowering stems to 4–5cm long, arranged in whorls of 5. Medium-sized, erect clone, to an average height of 1.0–1.2m, spread to 0.5m. Viable seed produced sparingly. 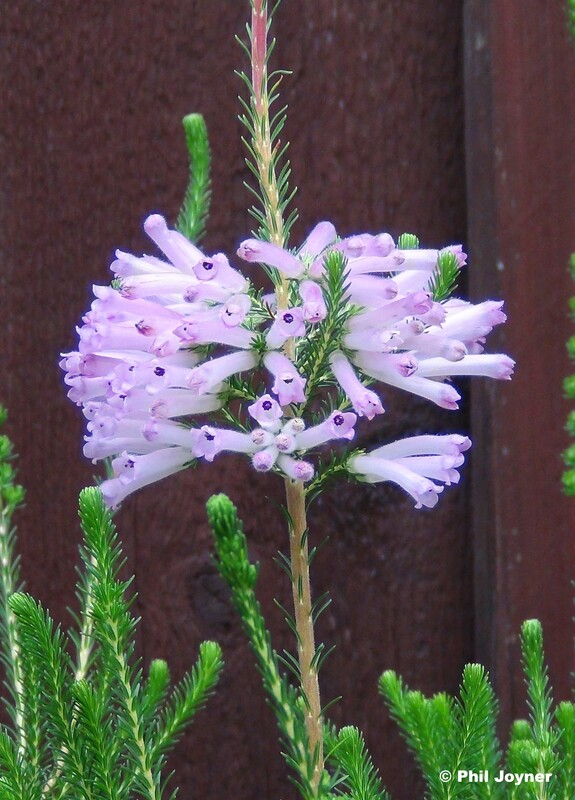 Origins: accession number 548/06; from the collection of the late Dr Violet Gray who was a member of The Heather Society’s Cape Heaths Group; she is also commemorated in Calluna vulgaris ‘Mrs Ronald Gray’. ® E.2012:09 registered by Anthony Hitchcock, Nursery, Plant Collections & Threatened Species Program Manager Kirstenbosch National Botanic Garden. Image courtesy of Phil Joyner.